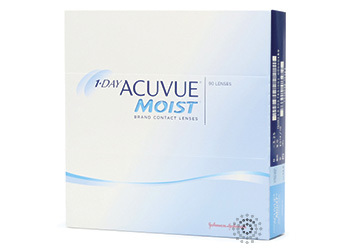 1-Day Acuvue® Moist® contact lenses, manufactured by Vistakon® and offered in this 90 pack format, provide the most convenient way to wear contact lenses with no lens care or messy solutions. Discard your lenses at the end of your day and enjoy the comfort of fresh, clean disposable contact lenses the next day. Be sure to follow your eye doctor’s recommended replacement schedule.